Battlecry: Deal 6 damage randomly split between all other characters. Does this work well with Brann? I drew this in arena, played it in two matches and both times it hit the enemy all 6 times. I'm assuming all characters means friendlies are fair game correct? It just totally won me the game. His little bro was also nice, turn 1 villain plays 2/1 stealth, i coin mad bomber. But that didnt prevent my enemy from dominating the board like that on turn 4. Coming up next epic Madderer Bomber with legendary Maddest Bomber. It's going to be really good in control Paladin! Great card to play on turn 5 (comeback from Paladin typical slow start) and really good in combo with equality. Any decks that currently run Mad Bomber should pick up and run two of these as well. Believe in the heart of the Bomber! (Well, except those for whom 5-mana cost is too high). I think 4 out of 6 damage will most likely drop on your opponents side if he has 1 minion and you have none. If you opponent has 3 minions and you have none, there will be 5 possible targets where only one of them are on your side. The average damage would be 1.2 on your side and 4.8 on you opponents. I think he will be an above average pick in arena but not so good in constructed. Yea, can't wait to see the Maddest Bomber. A 8 mana 7/6 legendary that throws 9 bombs randomly. You know.. just really for the fun of it. I see Noxious drooling all over this card... Randuin Wrynn Hype!!! Can't wait to see Trolden videos of this card lol, it's going to be glorious! So, you want to kill all your 1/1 opponent's minions? Let's hit 6 to your face instead! 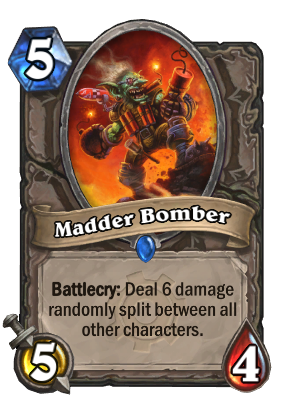 Madder Bomber is the collective rage of every Mad Bomber that didn't do as the player hoped it would. He has come back to... hit the player's own minions 6 times with bombs and potentially lose him/her the game. Calling it right now - Rad Bomber new meta. Great, as if Hearthstone didn't have enough RNG cards already.